There are many people out there who love asparagus, and love growing it fresh in their home gardens even more because it is one of the first vegetables to be harvested each season. 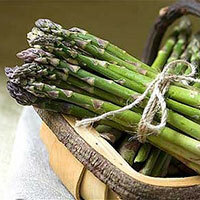 Asparagus is not just prized for its flavor, but also for its great health benefits as well. Not only is asparagus a terrific source for vitamin A, but it also contains large amounts of calcium, phosphorus, riboflavin, and vitamin C. Did you also know that 1 cup of cooked asparagus only has about 30 calories too? Most of us simply buy our asparagus from the grocery store, but perhaps you have wondered if this is something you can grow yourself at home and you are just not sure how to go about it. Well in this article we are going to show you just how easy growing harvesting asparagus can be, right in your garden at home! 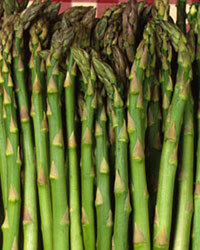 Asparagus is a perennial vegetable that has a very long life span. 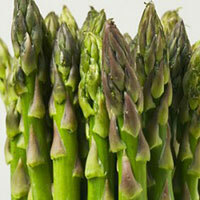 If properly cared for, your asparagus plants can grow and yield vegetables for as long as 15 years in many cases. Fortunately asparagus is a fairly easy vegetable to grow and it can handle most types of soil just so long as it has good drainage. One thing that asparagus does not do well in is soggy soils that stay wet constantly as this will eventually lead to a rotting of your plants' root systems. The best thing you can do prior to planting is test the pH of your soil and use any necessary amendments to get the soil within a range of 6.5 to 7.5. This is the ideal pH range for growing harvesting asparagus. If the pH drops below 6.0, you will need to correct it because asparagus will not do well at all below that level. 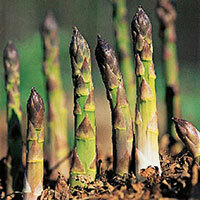 Another good thing you can do prior to planting asparagus is to till the garden with a good 10-20-10 fertilizer, down to a depth of about 6 inches. This should give your asparagus plants a really good start. Before you get into planting, you will first need to decide if you are going to grow your asparagus from seeds or from crowns. While many people enjoy starting vegetables from seeds, because it gives them the added satisfaction of knowing they grew their own plants from beginning to end, this is not always the most efficient method when growing asparagus. Asparagus really needs the first year at least to develop a nice and healthy crown, which means the first year you won't have any real spear production to get excited about. For this reason many growers simply opt to buy 1 year old crowns from reputable growers for growing harvesting asparagus. How many crowns you decide to buy will depend on how much asparagus you are hoping to harvest through the season. Each crown that you plant is capable of producing around one half pound of asparagus spears each year, once they have been completely established. Since asparagus is a multi-year commitment, you should make sure you plan accordingly. There are also new hybrid varieties out there such as the Jersey Knight, Giant, and Prince, which are all male varieties. On these types, seeds are only produced on the females, so by growing all males, all of your plants will be devoting their energy into fruit production rather than wasting energy trying to produce seeds. In most locations, you can begin planting your asparagus crowns as soon as the soil temperature warms up to at least 50 degrees. There really is no reason to try and plant them sooner because they simply will not grow until the soil warms up anyway, and planting them too early in cold wet soil only runs the risk of exposing them to Fusarium rot if the soil temperature doesn't warm up soon enough. Also because asparagus stays in the ground year after year, make sure you give them a location that doesn't get tilled with the rest of your garden. Growing harvesting asparagus is not all that difficult! A good site is a western or northern location, so that your asparagus plants are not shading other vegetables in the garden. Dig a furrow in the garden no deeper than 6 inches and dust the bottom of the furrow with a 0-20-0 phosphate fertilizer. Place your crowns in the furrow roughly 18 inches apart and then refill the furrow back to its original level. Some guides suggest a deeper furrow and refilling it slowly, however this is not necessary provided that you are careful not to compact the soil over top of the crowns. Once planted you should begin seeing spears emerge through the soil in about a week or so. 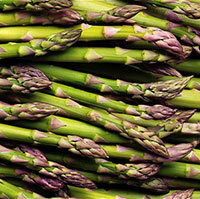 One tip if you have never grown asparagus before is do not harvest the spears this first year. You will see spears open up from the little buds and as they grow out to about 8 inches or so the tips will start to open. The entire spear will then turn woody and ferns will sprout. These ferns are essential to food production for the plant itself so removing them will only hinder the plant's growth overall. Let them be and the crown will store all this food for next year's production of spears. One of the biggest pests you will have to worry about when growing harvesting asparagus are the beetles. These insects will chew on the fern that sprout and cause them to turn brown. These insects also hinder the plant's ability to produce spears the following year by destroying the ferns that generate food. You can combat these with an insecticide as soon as the beetles are discovered. If you would like to be proactive on disease prevention, you can spray your plants with fungicide every 2 weeks from the time when the ferns grow to about 3 to 4 feet tall. Allow the ferns to stay on the plant over winter as this allows the maximum amount of photosynthesis to occur. You can cut or mow them back the following spring.